Trommel machines are essential for separation of materials of different grades and waste management. If you are thinking of installing a picking station, one of the accompanying facilities is the trommel. This machine helps to sieve and separate waste of different sizes. An automated trommel tumbles round and round with small-size materials passing through the trommel holes. Trommel holes vary depending on the type of material you want to separate from the waste. 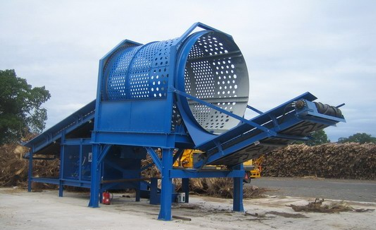 Here are some other factors that determine the right trommel screen for your needs. This should be the first thing you decide on. Do you want a trommel you can move to different places? There are mobile trommel machines you can move to different locations depending on your needs. However, there are also static trommel machines that are permanently fixed in your area of operation. The best type for you depends on your specific needs. Mobile trommel machines are usually preferred for construction purposes. Trommel machines vary in drum size. The size of the drum defines the amount of material the trommel can contain at a given time. A large trommel will take less time to sieve and separate a large amount of material compared to a trommel with a small-sized drum. The trommel drum tumbles round and round for the best separation of material. A fast revolving trommel will work faster than a slow-moving machine. This, however, should not be the only factor you consider. Some materials are best separated when the trommel rotates at a slow speed. Heavy materials, for instance, may damage the machine when moved at a high speed. You need to find a durable trommel machine. There are several manufacturers supplying trommel machines. However, not all of these manufacturers can be trusted to deliver a quality and long-lasting trommel. The quality of the trommel machine highly depends on the material used. Other factors you can consider are the reputation and experience of the manufacturer. Trommel machines are made for different purposes. A trommel used in gold mining can be different from that used in construction. Before you purchase a trommel, make sure that you consider the type and nature of the material. This may also help you customise your trommel to suit your needs. Finally, choose a trommel you can afford. Trommel machines are available at different prices based on size, purpose, and design. However, you should not compromise the quality of the trommel to find a cheap trommel. There are various sites you can compare trommel prices and choose the right trommel at the best price. If you are not in a position to buy a new trommel, you can hire one or look for used trommel machines for sale. Make your waste recycling and management easier by choosing the best trommel machine. As you can see, the right trommel for you depends on your specific needs. Take time to analyse your needs and budget before you order a trommel.